Inspired by the remixes of Becko, Hopes die last bass, and Vox, Resynthformation does not follow the archetypal pattern of dubstep. 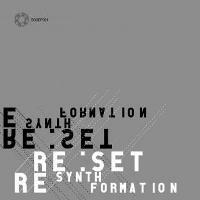 Re:set has succeeded in mixing styles, making this release a raw and genuine hybrid-style project. It shows a kind of style that is often lacking in electronic music these days. The album was released under Sostanze Records in Rome, Italy. The stabs and octaves of the Resynthformation (original mix) create sound waves that build a 3D dimension in your mind. Dizzying patterns and unfaltering propulsion appear all throughout this track. On the other hand, the Resynthformation (Becko Remix) starts off with a lethargic pace, making you sway like fabrics dancing with the light breeze. The thin melodies subtly mix with dub-inflected rhythms at the middle of the track. The slowly-stroking, dub-infected instrumental synth-pop makes this remix one of the best mixes in this record. Finally, Resynthformation (Jelle Boon Remix) begins by imagining that you are in for an intergalactic expedition. You are riding on a rocket and that it is going to fire into space in any minute and then it bombards you with electronic pounces and reverberations. You could just feel the endorphin-explosion seeping into your brain after listening to this last track. Resynthformation takes more amalgamated approach. The mixes in this album have several segments; each following an arrangement and developing fascinating dub-infected beats.